Our Split Magic Ergonomic Soft Touch Mini Keyboard has been designed to allow you to work at a more natural position. By providing rotation (to accommodate ulnar deviation) and tilt (to accommodate pronation) each section of the keyboard can adjust to a wide number of positions which allows it to be set in an arrangement that is comfortable for each hand of the user. 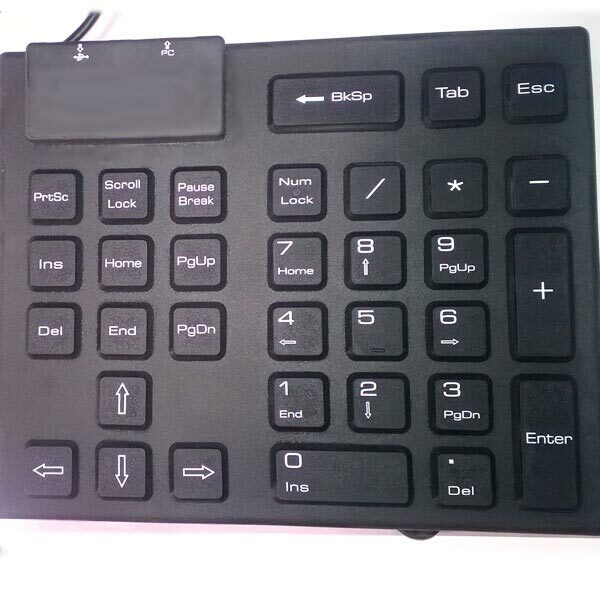 This keyboard features to 2 extra 2.0 USB ports for use as quick connections for your convenience. Also, the Keyboard features Soft Touch key switches, requiring only 20 grams of key force, whereas a standard keyboard requires around 45 grams force to activate the keys. This feature allows more typing comfort by eliminating unnecessary finger force. Cameras, MP3 players, Flash drives, Numeric keypads, etc. KBEMAST2U - Sections independently adjust to each person's natural typing posture. Each of the two sections can be placed at any distance with different angles. and easily locks into place. KBSTEM2U - Sections independently adjust to each person's natural typing posture.